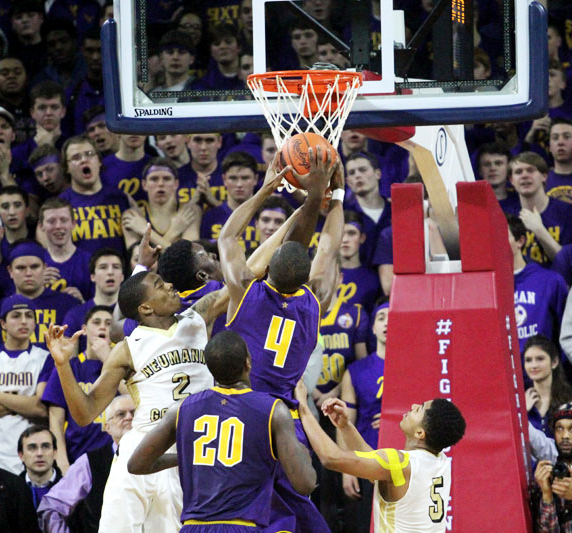 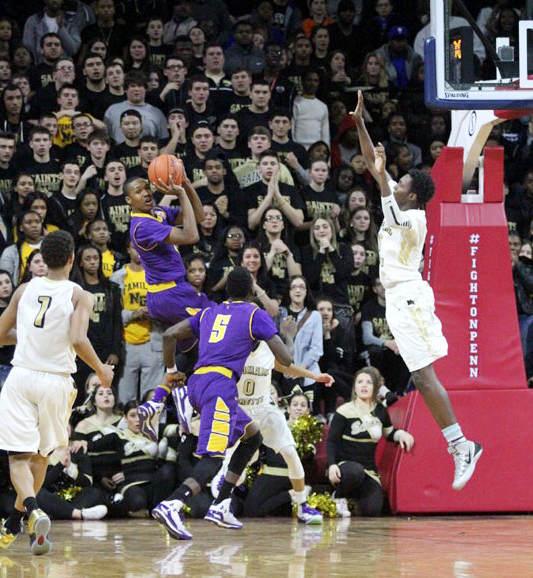 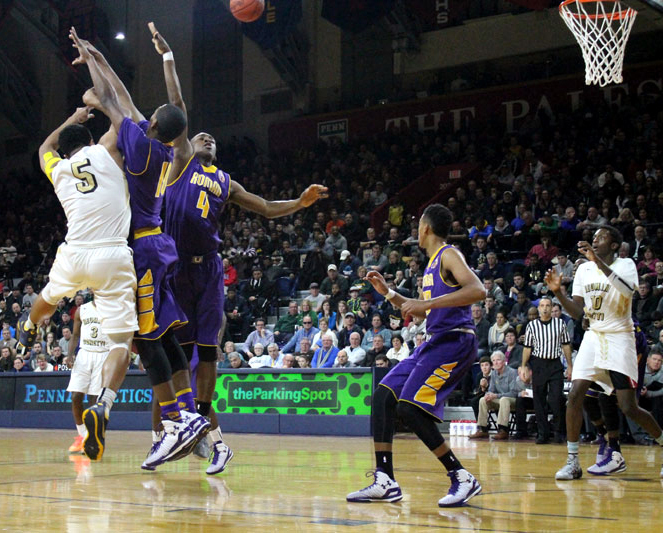 D’Andre Vilmar (left) of Roman blocks the shot of Neumann-Goretti’s Quade Green. 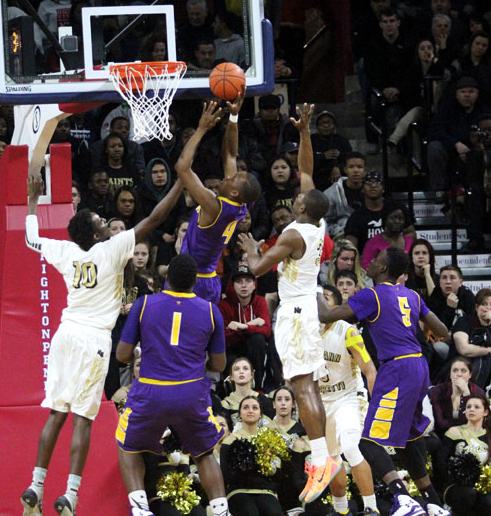 Lamarr Kimble (5) of Neumann-Goretti barely gets off a shot over Roman defenders Tony Carr (center) and Nazeer Bostick (4). 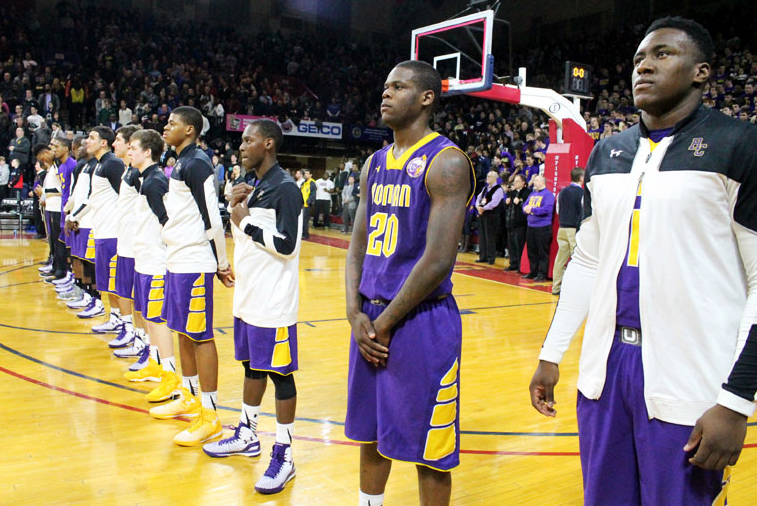 The Cahillites stand at attention during the pregame activities. 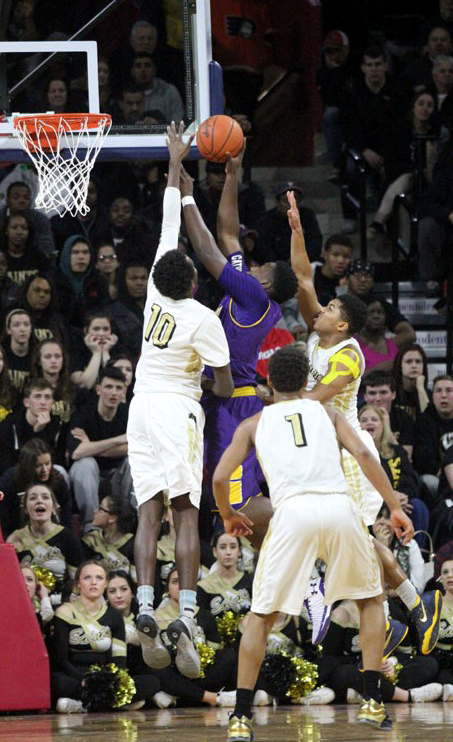 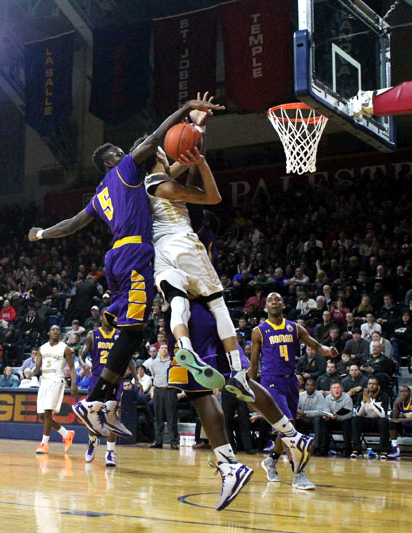 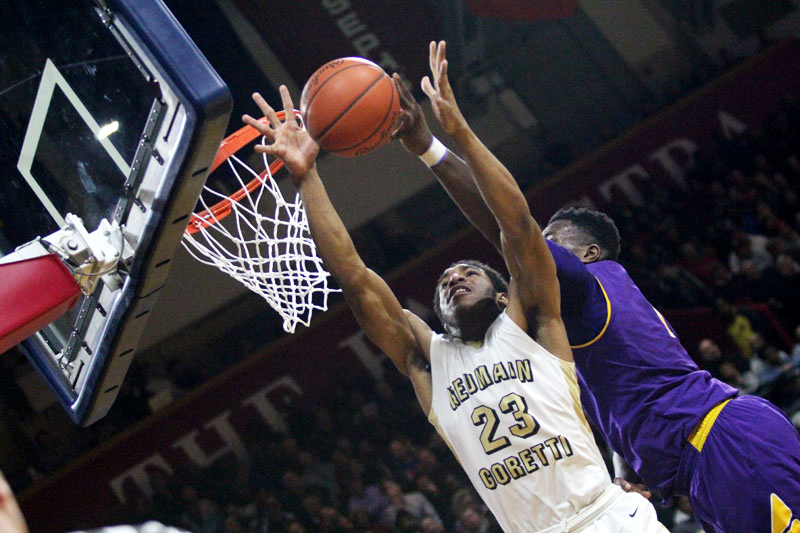 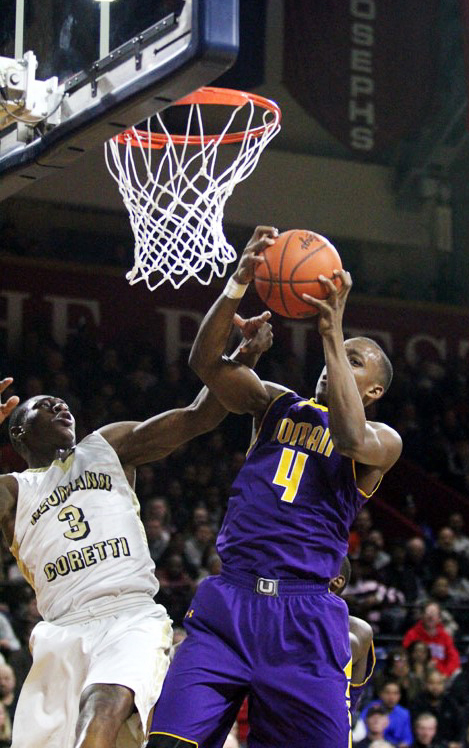 Neumann-Goretti’s Emil Moody and Roman’s Manny Taylor battle for a rebound. 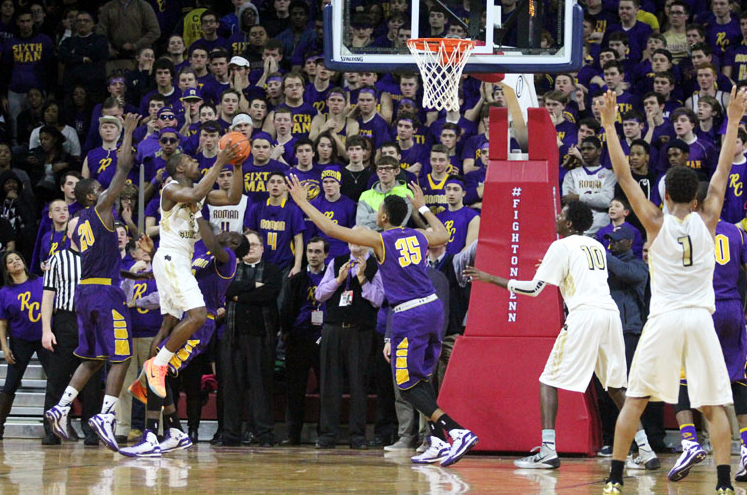 Zane Martin of Neumann-Goretti puts up a shot. 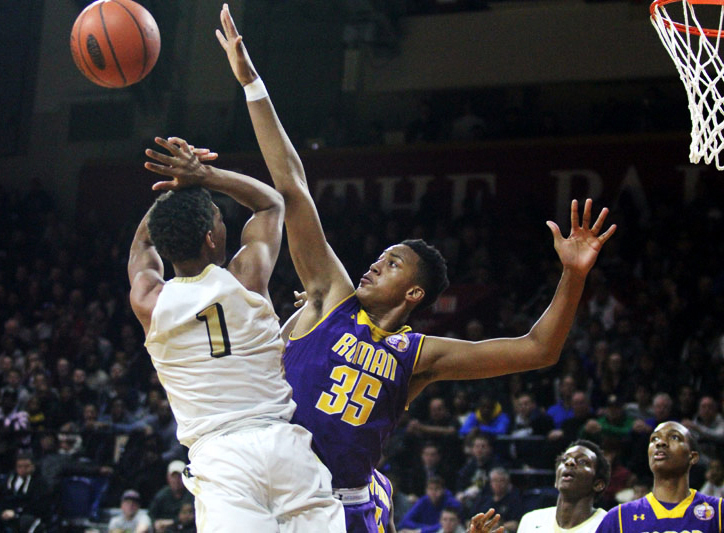 Battling for position under the basket are Roman’s Nazeer Bostick (left) and Neumann-Goretti’s Lamarr Kimble (center) and Quade Green. 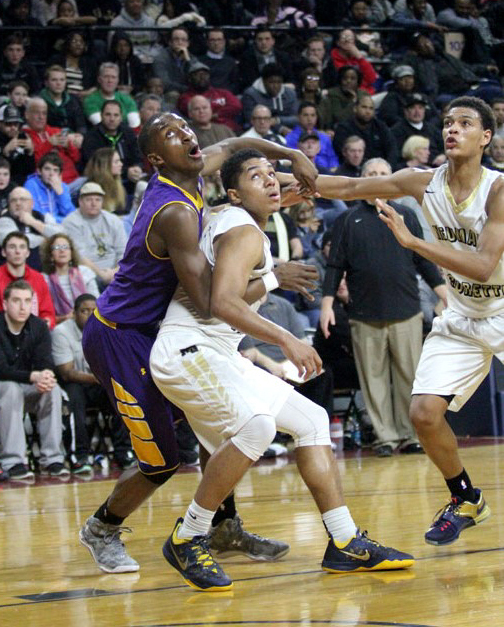 Zane Martin (left) of N-G and Gemil Holbrook of Roman battle for the ball. 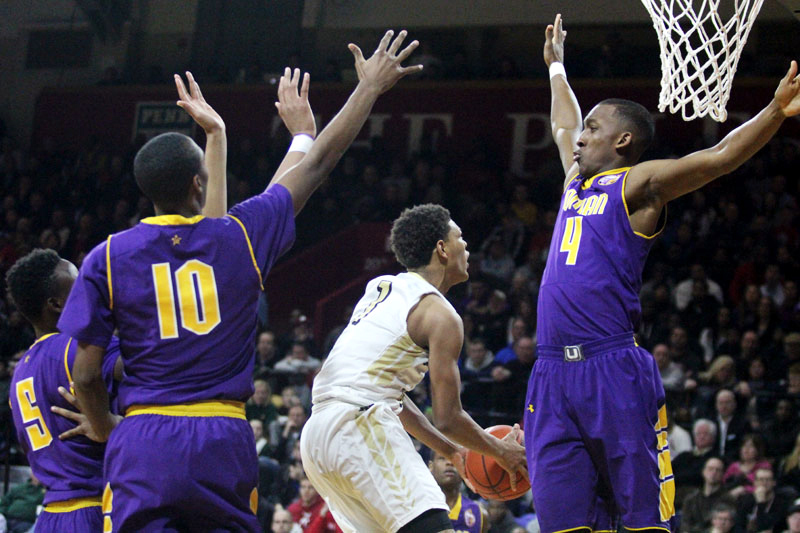 Roman Catholic standout guard Tony Carr (10) and teammates enjoy their slim lead over Neumann-Goretti during the Catholic League championship Feb. 23 at the Palestra, as Roman coach Chris McNesby (center, in gray) calls his players to the bench during a timeout. 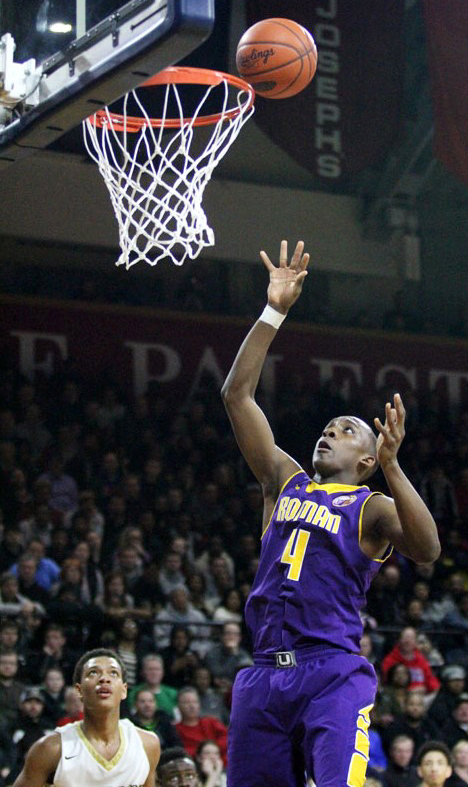 Nazeer Bostick scored a game high 23 points and grabbed 13 rebounds, along with tenacious defense for Roman. 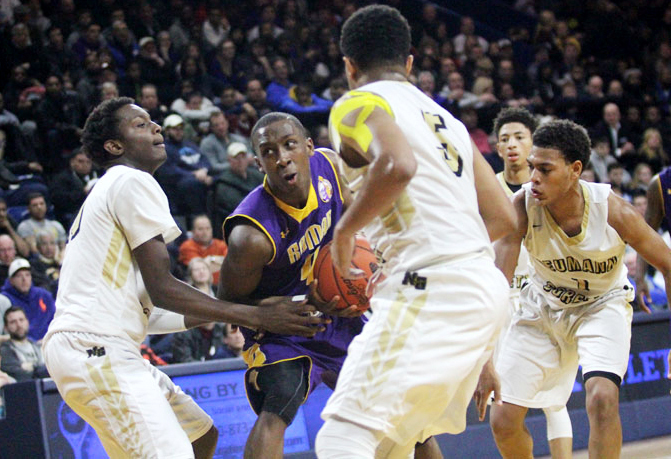 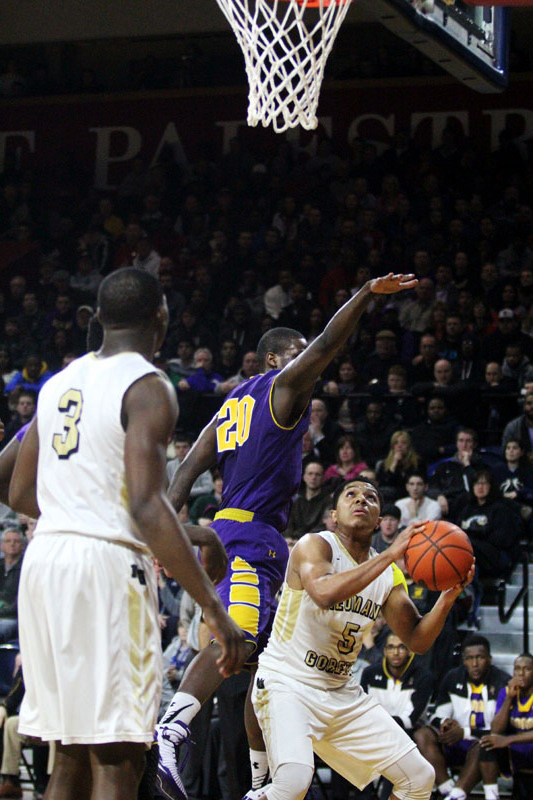 Bostick (with ball) of Roman ties to maneuver through the stout defense of Neumann-Goretti. 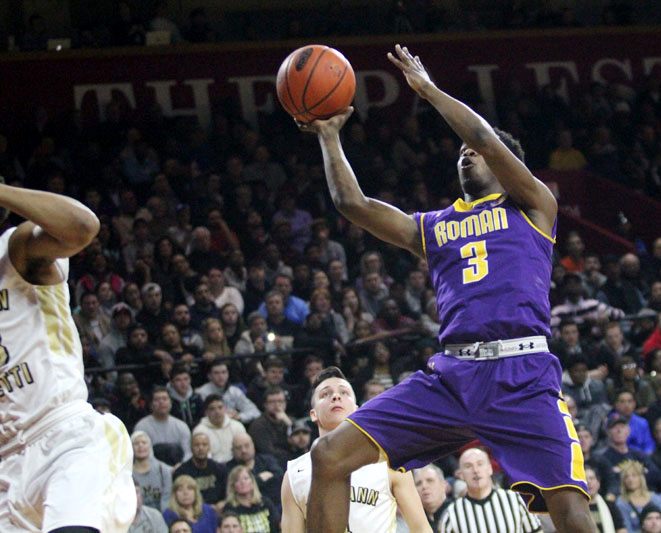 Jon-Paul Sanders takes a shot in the lane for Roman. 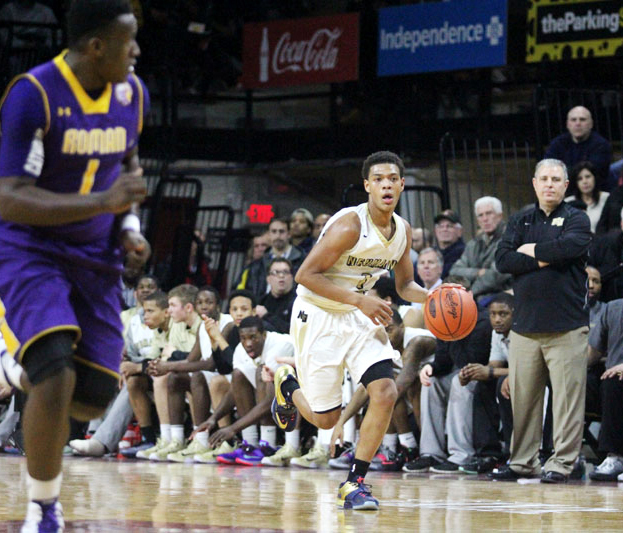 Quade Green brings the ball up the court for Neumann-Goretti. 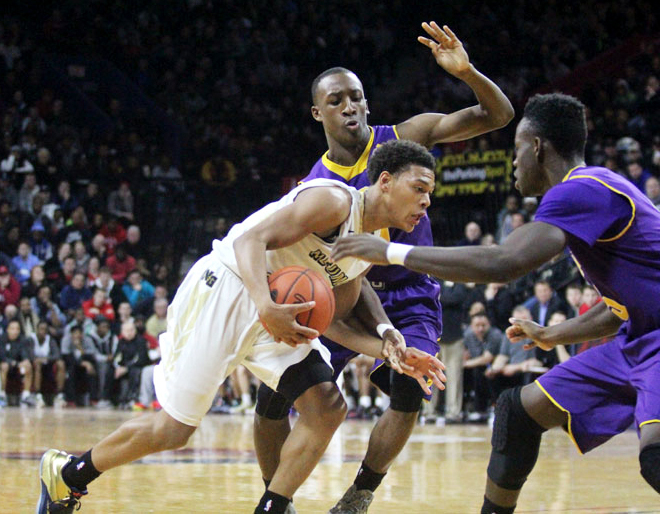 Lamarr Kimble of N-G tries to get around the defense of Roman’s Gemil Holbrook. 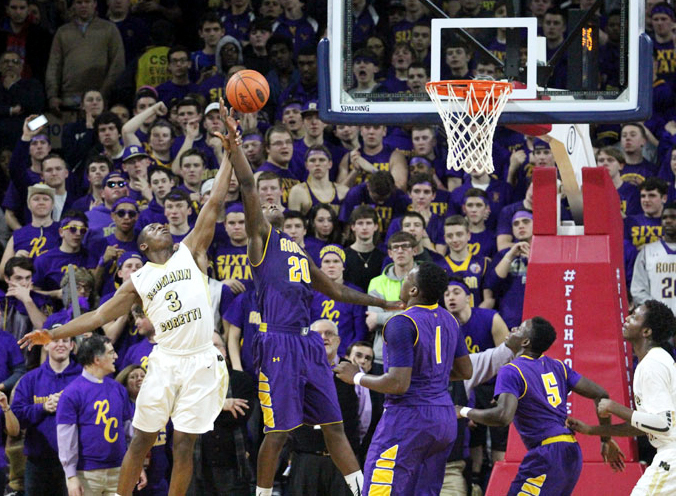 Quade Green (1) sees his shot blocked by Paul Newman (35). 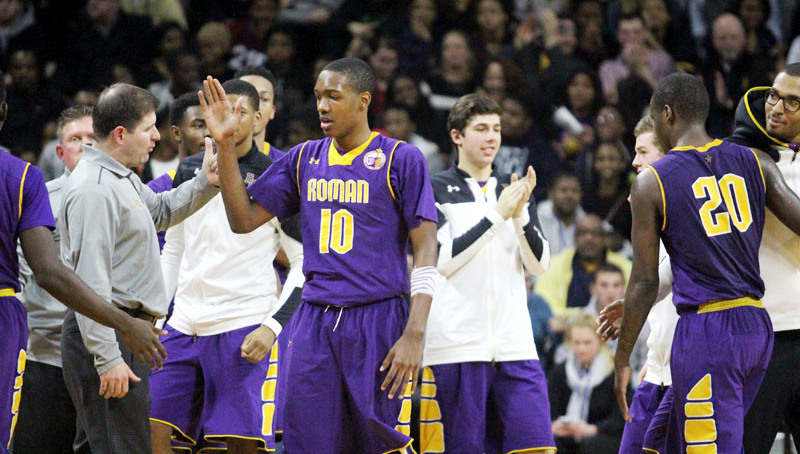 Roman’s Tony Carr looks for a teammate to receive his pass. 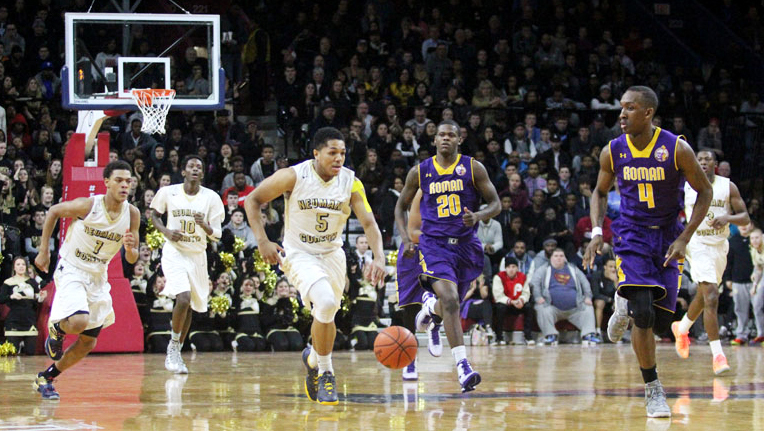 Lamarr Kimble brings the ball across mid-court as Gemil Holbrook (20) trails and Nazeer Bostick (4) looks to stop the ball.